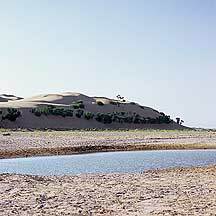 响沙湾沙漠Xiangshawan Desert is not far south of 内蒙古Neimenggu's (Inner Mongolia) 包头市Baotou City. I did not know of the area til I saw it advertised on the city's tourist map. 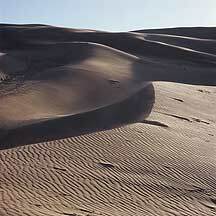 It was hailed as a phenomenon for being the closest sand-duned desert to a city, and as a natural wonder with giant sand dunes that loom 30 meters high on nearby farm fields. This scenic spot seemed quite popular as I saw a decent number of people while I was here in the late afternoon. Since it's a desert it wont be complete without the two-humped camels. And there were enough of them so no one has to fight for a ride. 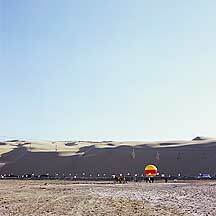 You can ride the camels on the ground and I am assuming you can do the same on the dunes above. But if you are tire of smelling the camels, there were also horse rides for your pleasure. 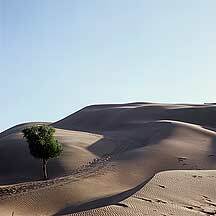 Read my travelogue on this area. 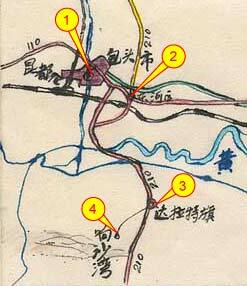 From 包头市东河区Baotou city's Donghe district (2), take a bus or minivan(Y9) south to 达旗Daqi County (3). The ride is about 45 mins. 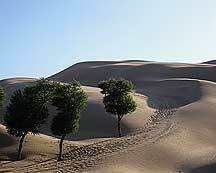 From Daqi's bus station, there are local public buses(Y5) to 响沙湾沙漠Xiangshawan Desert (4). This ride takes about 30 - 45 minutes. For more information, read my 《响沙湾游记》Xiangshawan travelogue. Getting back to the city is much easier as many buses converge in Baotou. Get on a bus at Daqi's bus station, or wait for one on the main road going north. 30 yuan. Cable car ride is 25 yuan. (summer 2006). 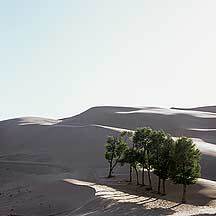 There are quite a few hotels and gers or yurts on the foot of the giant dunes, and on a hillside and the summit of a cliff. Get there early. 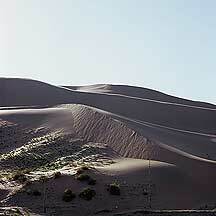 An overnight stay to see the sunset and sunrise over the dunes would probably be very rewarding.